Prior to his death, Apple co-founder, Steve Jobs, planned Apple Park down to the smallest detail. The master of contemporary design was intimately involved in every aspect of the new campus. Jobs; vision - estimated to have cost US$5 billion - is now a reality with the first employees this month beginning to occupy the site. Looking around them they will see the hallmark of Jobs everywhere. “This was a hundred-year decision. And Steve spent the last couple of years of his life pouring himself in here at times when he clearly felt very poorly. 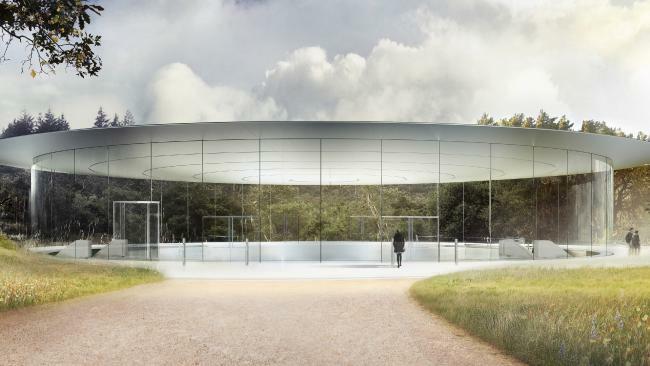 Perched on top of a hill at one of the highest points within the campus will be the Steve Jobs Theater, a 1,000-seat auditorium dedicated to the memory of the company's late co-founder and former CEO. The building features a 6-metre-tall glass cylinder that's 50 metres across and is topped with a metallic carbon-fibre roof. Visitors walk through the grassy meadow, up the hill to the minimalist see-through building (below). The actual auditorium is hidden below ground. Known internally as 'The Ring', the building has a circumference of 1.2km. In fact there is a walkway on the inner perimeter of the Ring so employees can stroll all the way around. The main thing that you notice about the Ring is the glass. 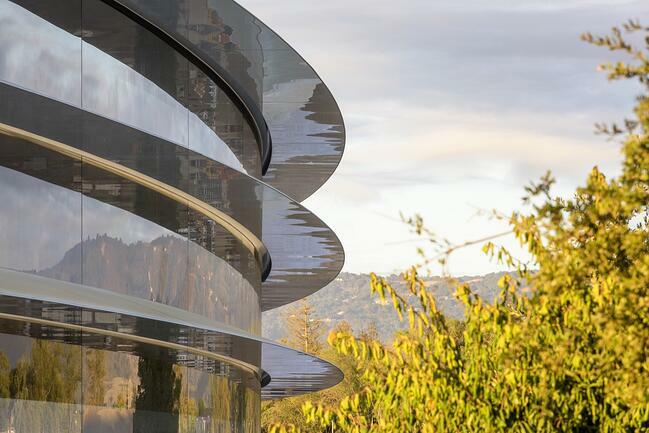 Apple has become a world leader in manufacturing the largest sheets of glass - first for its retail stores - and now for its HQ. And the attention to detail is incredible. For instance, designers have ensured that the project’s glass canopies won't take on the greenish hue typical of most glass panels (it comes from the iron in the sand) and instead will gleam brilliantly white. They also determined the perfect angle to set the panes so they wouldn’t show streaks after it rained. Jobs loved the California landscape and wanted the new campus to reflect the Californian landscapes from his childhood. He reimagined the current industrial landscape of the 0.7 square km site as rolling hills, hiking trails, trees and grasses. He wanted to blur the line between inside and out so that employees could be inspired by the beauty of nature. He was inspired by a large space known as the Main Quad on the Stanford campus, and by a nearby Stanford hiking area, The Dish. Since it’s a ring-shape, there is no main lobby to the main building. Instead there are nine entrances. Jobs was intimately involved in designing the workspaces and adament it would be a workplace where people were open to each other and open to nature. The key to his vision was modular sections, known as pods, for work or collaboration. Jobs’ idea was to repeat those pods over and over: pod for office work, pod for teamwork, pod for socialising. They would be distributed demo­cratically. Not even the CEO would get a suite.. And while the company has long been notorious for internal secrecy, compartmentalising its projects on a need-to-know basis, Jobs proposed a structure where ideas would be more freely shared across common spaces. “At first, we had no idea what Steve was actually talking about with these pods. But he had it all mapped out: a space where you could concentrate one minute and then bump into another group of people in the next,” architect, Christoph Behling says. 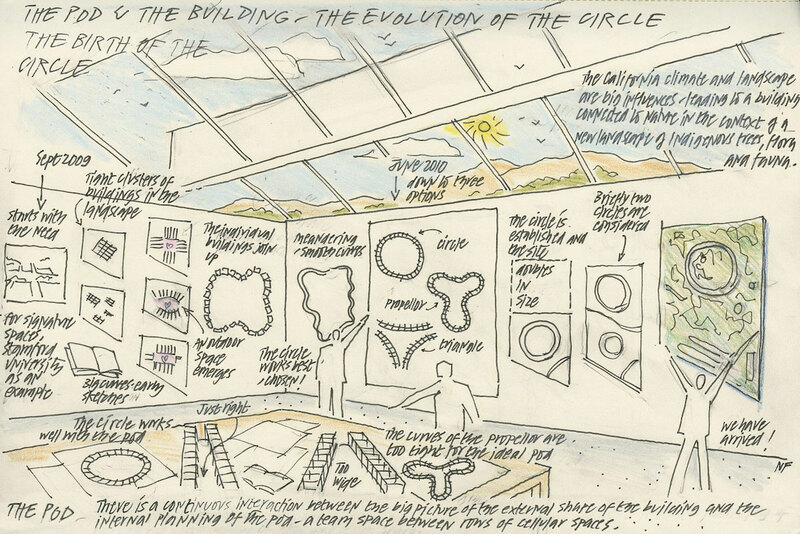 Image: A sketch by architect Norman Foster of the evolution of the Ring determined by the need for work pods. Jobs determined there would be one restaurant. It was deliberately conceived to make people come out of their spaces and connect. The café in the Ring is a massive atrium-like space ascending the entire four stories of the building. It will hold as many as 4,000 people at once, split between the ground floor and balcony dining areas. 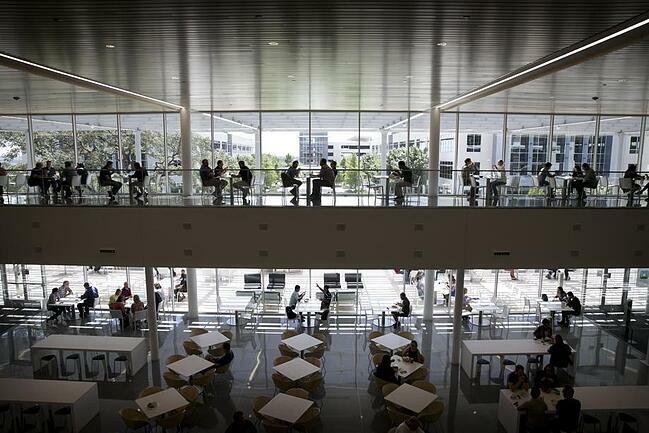 The sliding glass doors along the exterior of the café extend the full four stories of the building. Weighing 199.5 tonnes each, they open and close quietly via mechanisms hidden underground. The only doors in the world that size are on an airplane hangar. Employees are our customers too says Tim Cook and they are well catered for at Apple Park. A separate outer building houses a Wellness Centre complete with a two-story yoga room, fitness and weights areas. Outside there are 3.2 kilometres of walking and running paths, plus an orchard, meadow and pond. 1,000 bikes will be kept on the site and available to staff to get around the campus. In typical Jobs' style, the yoga centre is covered in stone from a quarry in Kansas, that’s been carefully distressed to make it look like the stone at Jobs’ favorite hotel in Yosemite. 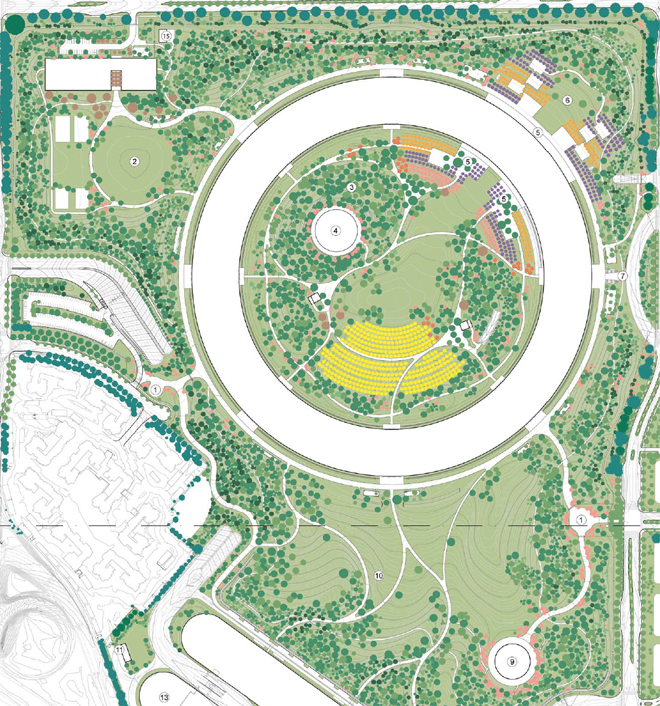 Jobs did his best thinking during long walks in nature, and he envisioned a tree-filled campus where Apple workers could find inspiration from nature. 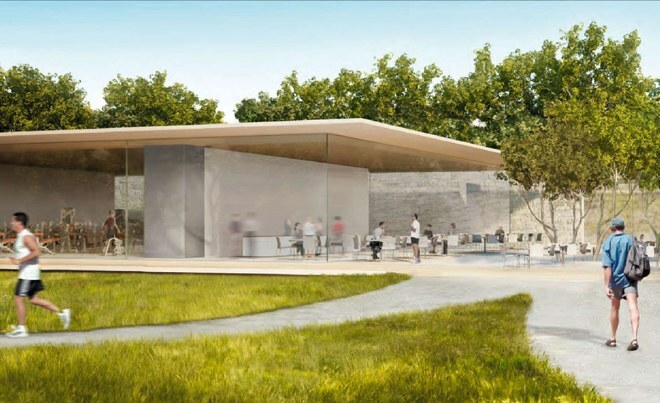 In total Apple Park has almost 9,000 trees, all of them drought-­tolerant so that they can survive a climate crisis. Jobs was adamant that the new campus house local flora, and in particular he wanted fruit trees from the orchards he remembered from growing up in Northern California. A dense perimeter of trees will ring the site, serving as a visual buffer from prying eyes outside. Below the main building, there will be a vast lawn, stretching down to the auditorium and parking decks below. Jobs hated air-conditioning and especially loathed fans. (He vigilantly tried to keep them out of his computers.) But he also didn’t want people opening windows, so he insisted on natural ventilation, a building that breathes. Unlike sealed buildings in which the temperature is rigidly controlled, the Ring circulates outside air. To fulfill Jobs’ wish for a building that breathes, the engineering team consulted with experts who optimise airflow in Formula One race cars. The Ring inhales air through the undersides of the canopies along its perimeter. Elsewhere, shafts that act like chimneys exhale warm air back outside. The flaps and the opening mechanisms all relate to sensors that measure where the wind is coming from and how the air goes through it. The concrete in the floor and ceiling is embedded with tubes of water and is supposed to lock in a temperature between 18-25 degrees, so that the heating or cooling system will kick in only on very hot or cold days. Apple plans to power the headquarters with its own energy center that will run mostly off the grid. Most of the power for the site will come from an on-site low carbon Central Plant. The roof structure is home to a 17 MW rooftop solar array that will power 75% of the building during peak daytime hours, with the remaining 25% coming from other renewable-energy sources. Suffice to say, the final product is a gift. Microsoft overtakes Apple in the innovation stakes - yes really!